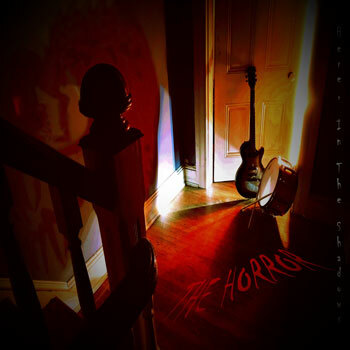 The Horror is an instrumental progressive rock duo from Baltimore, MD, composed of cousins Alex Wachter (Guitars, Keyboards, Bass and Mixing) and Jeff Zuback (Drums, Percussion). 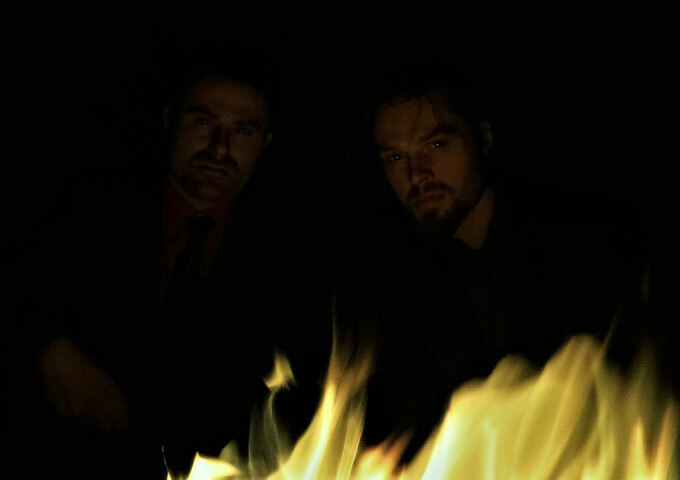 Currently promoting their debut album “Here, In The Shadows”, Alex and Jeff have been playing together their entire lives but this is the first project where they feel they have truly been able to do their own thing, and harness a soundtrack-inspired rock sound that they have cultivated over many a long jam session. I just found out about these guys recently and I have to commend them on their musicianship and decision to do instrumental music. They are free from catering to some growling or shrilling vocalist who would undoubtedly wreck this music with bad themes and worse singing. The Horror blend together all the good elements of cinematic metal, progressive rock and grungy psychedelia without the disruption of some wailing idiot trying to add any shrills. In the case of this duo, the music is always headed somewhere and very vibrant. Many of the musical passages they have composed would not have come to be most likely if they were trying to fit in a vocalist. This is exiting and hopefully they don’t rethink their formula or be forced to by the short attention span of most music buyers. 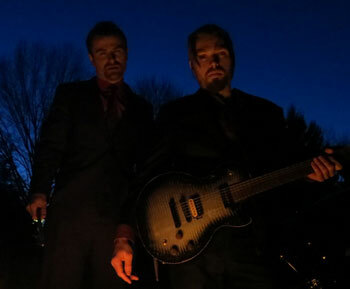 From the start of “Here, In The Shadows” you can tell the ambitious ideas and musicianship is top notch, and it is a surprise when you realize they get all this sound as a 2 piece. The few bands at the helm of this new territory are critical to pushing rock music forward. 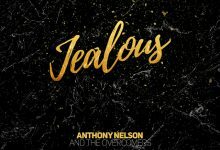 One of the key ingredients is that the musicianship is great but not by the amount of notes per second rule that used to apply. This music is about sound, emotion, atmosphere and creativity and has far more impact than the million notes approach. The Horror are working towards creating cinematic imagery with sonic modules – or rather, making audio visible to the mind! Right from the opening track, “Forgotten Way”, this album shows a band expertly crafting instrumental rock full of endless creativity, equal parts aggressive and ethereal, as well as rich with requisite tension and release. Throughout the album, Jeff Zuback’s drumming drives the songwriting. With surgeon-like precision, Zuback dissects the pulses of his melodic counterpart, creating a counter-point to every chordal shift. As textural as anything on this recording, Alex Wachter’s guitar work often captures the focus, drawing from a seemingly endless tonal palate. One central challenge for instrumental rock bands is to find that elusive middle ground between developed musical narratives and self-indulgence. The Horror reminds listeners that instrumental music can be infinitely malleable and defiant of expectations. The band already kick into overdrive on the second track “Your Best Bet is to Run”, which is continued with the pumping acid-rock of “Melee”. But it’s on multi-timbral pieces like “Passage” and “The Slumbering Lurking” that The Horror, showcase their quintessential skills. This album is a fluid tapestry that barely flirts with self-importance, yet on “Oozy”, guitarist Alex Wachter comes into his own and you can’t help but not ignore the technical brilliance. “Valhalla” and the three-part “Leviathan” brings deep into the previously mentioned cinematic scope of The Horror’s music. These tracks could easily form part of an epic soundtrack. Painting soundscapes with strokes of dynamism and tonal manipulation, the sometimes aggressive rhythms and murderous riffs are brilliantly laced together by vivid, interweaving, harmonic passages that delicately deliver respite for your eardrums before once again subjecting them to a marauding, inundating wall of sound. “Here, In The Shadows” is a perfect example of The Horror’s ability to analyze and interpret multifaceted emotions without needing to sing a single word.